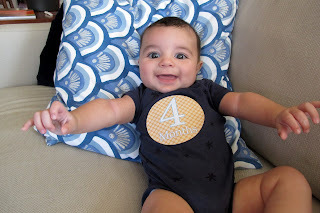 Baby Nautical is now 4 months old as of Friday. Time is just flying by! 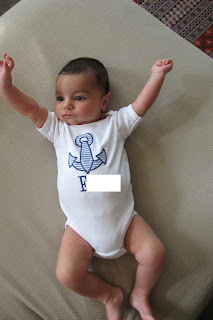 I asked Blair of Lulu McGee (you might know her from her blog Dirty Martini Diaries) to make Baby Nautical an anchor onesie. How cute is this little onesie?! Way, way, way too cute! Kate, he is just precious! I adore his hair! He is just the cutest! He looks like such a happy little boy! He is the cutest little thing!!! He's adorable! Baby clothes are just the sweetest thing.